Recovery was brutal. Nathalie experienced life like a small child, all over again. Her path was long and arduous. It still continues. Nathalie Jacob, with her daughter and her book. Yet Nathalie — married to Simon Gilbert, with a 2-year-old daughter Nicole — has persevered. She re-learned simple tasks, then moved on to more complex ones. She’s now the creator and admin of popular Facebook groups like Westport Stay-at-Home Moms, Westport Women and Tumores Cerebrales. She’s also the author of a new book. 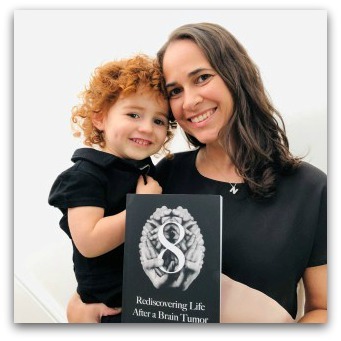 “8: Rediscovering Life After a Brain Tumor” celebrates courage, resilience, and the importance of a fighting spirit. Nathalie is always giving back. She’s donating all profits to the Connecticut Brain Tumor Alliance. She launches her book this Friday (February 8, 7 p.m., Saugatuck Congregational Church). But “Health, Wealth & Fun” is not a solo event. Nathalie will share the stage at the evening of food, drinks and networking with 2 other talented Westporters. Both are introducing their own intriguing projects. Friday’s Saugatuck Church event is not quite that. But it sure is a great night to celebrate health, wealth and the human spirit.